How could they do it? How could they treat human begins as animals, as worse than animals, abusing them to the point of death, then jamming those who survived into the lower decks of ships for a weeks-long journey that would kill even more of them? Forget the inhumanity of it: who treats valuable stock like that? I was not asking these questions, though I could have. I raise them whenever I contemplate the evil my people—white European colonists—visited upon first the indigenous population of the New World, then upon countless millions of Africans. Last night, as we gathered for a banquet to mark the end of the International Body Music Festival, I heard these questions from a fellow IBMF attendee who, hours after the final cultural event of our week in Ghana, could not put it out of her mind. 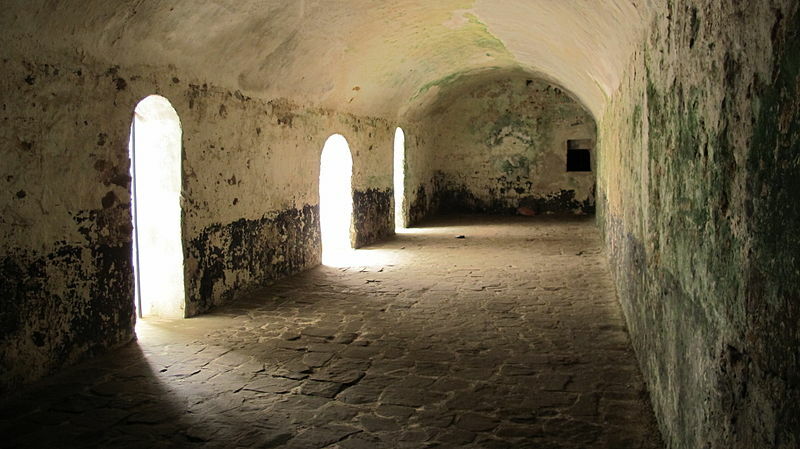 Visiting Elmina, one of many slave castles on the coast of west Africa, is a shattering experience. The old buildings, some dating to the 16th century, are maintained but not improved by the government of Ghana, and so many of the holding cells that were once crammed with Africans awaiting transport reek of mold and mildew. The smells could be easily erased with some bleach and an anti-fungal treatment, but it’s kept to give visitors just a small, acrid taste of what the prisoners endured. Entering Elmina sets your teeth on age before you even cross the drawbridge. Four years ago, on my first visit, we had to wade through several blocks of aggressive vendors, all wanting to develop a friendly relationship with us so they could con us into purchasing whatever they had to sell. This time, it was somewhat easier: there is now parking at the base of the hill upon which the castle stands, so the sales gauntlet was far shorter. That was still enough to put me in an agitated frame of mind, especially when added to what I knew awaited me inside the castle’s walls. The slave castle does not offer a self-guided tour option, though once one has completed the official tour, one can roam the grounds freely. As much as I like to guide myself through monuments and museums, I did not regret in the least the presence of this docent. He was eloquent, polite, but brutal, simply laying out the horrors visited upon centuries of African slaves at places like this one. Why would the slave merchants treat their stock so lethally that many of them would die without ever leaving the castle? Two possible reasons, he explained: to break their spirit while weakening their bodies, thus lessening the likelihood of a rebellion; and to cull the weakest from the population, ensuring that only slaves strong enough to endure the middle passage would pass the point of no return to board the slave ships. There is no question but that the colonial slave trade was one of the greatest inhumanities ever visited by human beings upon each other, though it has its rivals: the Holocaust; Stalin’s forced starvation of tens of millions of his own citizens; the ethnic cleansing horrors of Rwanda and the Baltics. The abuses being visited upon immigrants and refugees by the Trump regime do not yet rise to this level of criminality, but it is not for lack of trying. Trump-pardoned Sheriff Joe Arpaio routinely arrested persons of Mexican ancestry and subjected them to cruel prison camp conditions every bit as inhumane as the Nazi death camps, and the forced separation of infants and small children from their mothers doubles down on this approach. Human beings and their governments are still treating people who look or sound different from them in ways that, if they were inflicted on animals, would be deemed so cruel as to merit condemnation and even imprisonment. It was a powerful, emotional moment. Coupled with the reminder that Ghana has, in its curation of Elmina and other slave castles on the Cape Coast, been unflinching in its acknowledgment not just of the evils of slavery, but of the role other Africans played in promoting and maintaining the institution, I am led, once again, to question why white Americans, who have benefitted the most from the unpaid labor of generation upon generation of slaves, as well as persecuting post-slavery African-Americans to the extent that it was almost as if slavery had not ended, can be so defiantly in denial about the sins of their own ancestors. The privileges and status enjoyed by white Americans, the security they feel in their daily existence, the disproportionate opportunities they enjoy for education, economic advancement, and political power are all thanks to the brutalization of uncounted millions of slaves. And yet, the only monuments or memorials to slavery of which I’m aware are stations on the Underground Railroad. Meanwhile, throughout the South, monuments to officers in the Confederate Army, a force tasked with protecting and preserving the institution of slavery, have proliferated, and their removal remains controversial. I know it’s impossible to imagine the current regime taking any steps to apologize to African-Americans for slavery, let alone making amends and paying reparations, as was finally done with respect to Japanese internment camps. This president and is minions will not even acknowledge the simple statistical facts of race-specific police brutality, insisting that the disproportionate deaths of African- and Mexican-Americans at the hands of police are somehow deserved. But for all its extremes, there is nothing new about the racist side of Trumpism: it’s simply the latest manifestation of a phenomenon that has been a part of the New World since Europeans first came to it, that continues to afflict the lives of Americans of color, and will continue to do so, whether under the banner of Trumpism or whatever takes its place, until the United States delivers racism the rebuke it has deserved from its first incarnation on the shores of West Africa.